Here I am several days later, and this phrase continues to resonate in my mind. Even at my age, I continue to question what I will be when I “grow up”. How I can make a difference, better myself and help others. Would “changing the picture” be giving in to mediocrity? Or would it simply be accepting happiness and life as it is? Perhaps turning the channel is the better solution? I don’t know. Just thinking outloud…..because of a thoughtless tv show. 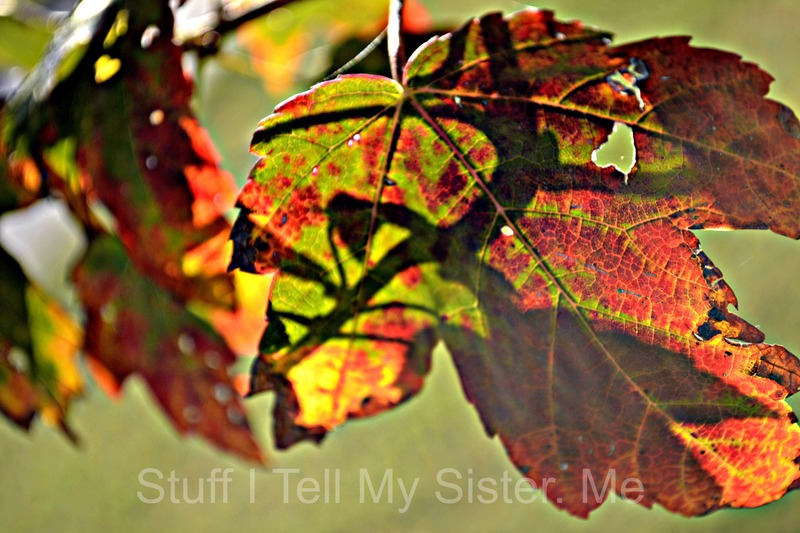 This entry was posted in Curiosity, ponderings, Ramblings, Reflections and tagged Changing the picture, fall leaf photo, happiness, making a difference, mediocrity, mid-age, The picture in your head, When I grow up. Bookmark the permalink. 39 Responses to Change the Picture? Hmmm? Let’s see: “make a difference, better myself and help others” – I think you’ve found your niche right here, girlfriend! And I don’t believe I know anyone who has accepted “happiness and life as it is” as well as you. I know that you have made a huge difference in my life (as well as many, many others) and for that, I thank you! Have a great rest of the week! I also agree with that statement on some level. Usually young people have a good picture about how they want their lives to be when they’re 25,30,50, whatever, but rarely does that come true. I know I had a plan, but I ended up having a child early, and my plan changed. Am I where I thought I’d be at 29? Not even close. Am I happy? Yes, because I changed my mental picture of my future to accommodate the wonderful changes in my life. Does that mean I stop having goals, stop trying to better myself, stop trying to reach higher? Nope. I still have the forward momentum, just on a different track. I think there’s a bit of both. I think you can choose happiness by having a positive attitude – I love the phase from the Bible “I have learned the secret of being content in any and every situation” – I think contentment can allow for happiness. You never want contentment to transition into complacency though – we can always do, serve, give, achieve more. I like to think I am happy in either case. oh very good points!!! I love that verse too. We have lived in so many states. The KJV says “to be content in whatever state I am in” so we always laughed about that. I have been content in AR, MO, OK, & TX….well….not so much TX! lol! “Changing the picture” wouldn’t necessarily mean giving in to mediocrity. Sometimes, we stick to a picture that we developed through our childhood but isn’t really valid any more. Maybe you’ve outgrown the picture you had and changing it would allow you to feel more grateful and happy on a daily basis? I think you are right. It’s so easy to be “set” and not want to change. Even when it is better for you! You’re not giving yourself enough credit! Easier said than done, I know…but sometimes our paths take on a life of their own, right? In the end we make ourselves into what we really want to be. I think a lot of times we don’t realize how blessed we are and that there are so many people who trade lives with us in a heartbeat, without a second thought. 97% of the world would see north americans as millionaires. My bathroom is the size of most family homes in the rest of the world. I have had some struggles for sure, but for the most part I do not have to continually think about where my next meal is coming from or where I will sleep tonight. Happy is good. If you can make a difference to someone or the world along the way, it can also be even more fulfilling. I have no doubt you do that, Paula. As we all know, acquiring “things” don’t make us happy. I’ve never seen a U-Haul behind a Hearse, have you? What you have stuffed in your closets will probably go to the GoodWill store at some point. I think we all are happier than we believe we are. Good health is taken for granted, until you don’t have it any more. Learning to let go of old grudges and learning to forgive, is a big happiness spreader. We all have the ability to “change that picture” every day. Thanks for bringing this to mind, Paula. You have been nominated for the Liebster Award. To learn about the rules for this award, please go to http://changeforbetterme.wordpress.com/. Congrats! You are right….and I love the analogy….”the whipped cream with the cherry on top”….perfect! 🙂 Thanks Debra! Diana sent me – love your blog! And, I visited a nutritionist for the first time yesterday and she suggested that I find ways to ‘reward’ myself — instead of beating myself up for not being perfect, or not accepting the things I do that make a difference. What a uniqued idea from your nutritionist! To reward yourself. Who does that? Great thoughts to process! Embrace happiness and you will vibrate into the Universe and cause love and happiness, if even for a moment to everyone you come in contact with. Be grateful for every moment of happiness.